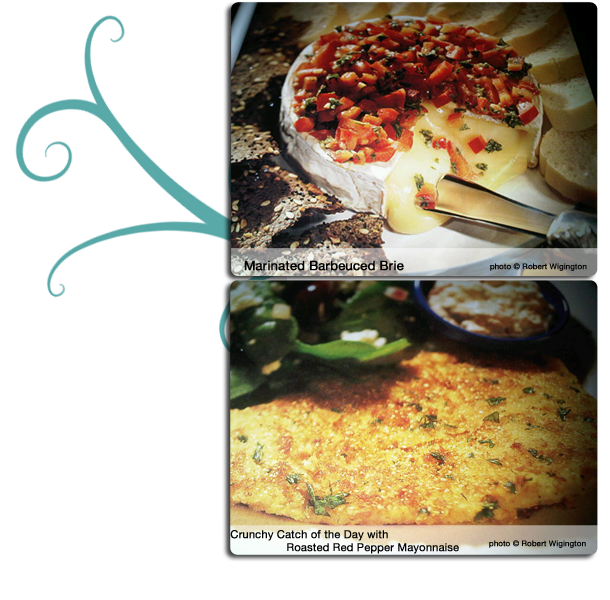 Check out one of the menus from The Two Sisters Cookbook and give the recipes a try. They'll give you an idea of the cooking style, the ease of preparation, and how to "add the love" to your dishes. The flavourful olive mixture marries beautifully with a rich and creamy Canadian goat cheese. You can substitute an equal amount of roasted peppers for the olives if you'd like to change things up. Serve with French bread and assorted crackers. Slice cheese into eight rounds and arrange on a shallow platter. Combine vinegar, garlic, thyme, mustard, and pepper in a large screw-top jar. Cover and shake well. Add oil slowly to vinegar mixture and whisk to combine, then cover jar and shake well. Add olives to oil mixture and stir to combine. Pour olive oil mixture over cheese and refrigerate for 2 hours. Bring cheese to room temperature before serving, about 30 minutes. Add the love: Sprinkle cheese with parsley. Tips: Use dental floss to slice your cheese – it works like a charm. And it's important to use really good-quality olives, olive oil, and balsamic vinegar in this recipe because they're the main ingredients that make this dish so yummy. Our cousin Elvira manages a women's clothing boutique in Speyer, Germany. When her window stylist needed a Canadian menu for his gourmet club, this recipe made it all the way to Europe. Combine rye, maple syrup, mustard, onions, garlic, salt, and pepper in a medium bowl. Slowly whisk in oil. Add tenderloins to marinade and marinate in refrigerator overnight. Oil grill and heat barbecue to medium high. Grill tenderloins, turning occasionally, for 20 to 35 minutes (or test with an instantread thermometer inserted into thickest part of meat). Remove tenderloins from grill and cover with foil. Let rest for 5 to 10 minutes before slicing. Add the love: Arrange pork on a platter and garnish with parsley sprigs. Tips: I like to marinate meat, fish, or poultry in sealable plastic freezer bags. The marinade completely covers the food, it's sealed so that it doesn't leak, and clean-up is super easy. You can also bake the tenderloins on a metal rack in a preheated 375°F oven for 20 to 40 minutes. Dad always says to eat up what's left "so we'll have nice weather tomorrow," but with these potatoes, we never need any extra motivation to finish the last bite. Heat oil in a large, shallow, non-stick frying pan over medium-low heat. Sauté onions until light brown, about 6 to 8 minutes. Add potatoes and garlic and sauté for 5 minutes, stirring occasionally. Add stock, wine, mustard, salt, and pepper to potato mixture. If liquid does not completely cover potatoes, add more chicken stock or water to just cover potatoes. Place lid slightly ajar on pan, bring to a boil, then reduce heat to low and simmer for 20 to 25 minutes, stirring occasionally. Test potatoes with a sharp knife, they should be cooked through. Remove lid, increase heat to medium high, and cook until most of the liquid has evaporated, stirring often to prevent sticking. Add the love: Sprinkle potatoes with parsley and a light dusting of smoked salt. Tip: For easy clean-up, ( "Is clean-up ever easy?") use a non-stick frying pan with a lid when making these potatoes. This recipe is at its best when asparagus is in season. From May to late June we pick it fresh from Mom and Dad's garden. You can also make this dish with broccoli or green beans. Bring a large pot of well-salted water to a boil over high heat. Add asparagus to water and boil until crisp tender but still brightly coloured, about 4 minutes. Drain asparagus and rinse under cold water. Dry asparagus with paper towels. Heat butter in a large frying pan over medium heat until butter is bubbling (take care not to burn butter). Add garlic and cook for 20 seconds. Add zest and pepper and cook for 1 minute. Add juice, dill, salt, and asparagus and toss to combine. Heat gently until asparagus are hot. Tip: Asparagus stalks that are of equal thickness – medium to slightly larger than medium – are recommended for this recipe. This dish was my second winner in Cottage Life magazine's annual recipe contest – and this time I tested the recipe before submitting it! The previous winner was the Marinated Barbecued Brie. This salad is really popular– you might want to make a double batch! Combine blueberries, sugar, and water in a small saucepan and cook over medium heat until syrupy, about 5 minutes. Cool blueberry syrup. Add 2 teaspoons lemon juice. Store syrup in refrigerator until ready to use. Combine lemon juice, garlic, sugar, salt, and mustard in a screw-top jar. Cover and shake well. Add oil and shake until well combined. Store vinaigrette in refrigerator until ready to use. Combine mixed greens, almonds, and cheese in a large shallow bowl and toss with vinaigrette. Drizzle blueberry syrup evenly over salad. Tip: When making a salad that includes ingredients other than lettuce, I like to keep a few of them on the side. After tossing the lettuce with some of the ingredients and the vinaigrette or dressing, I then top the salad with some of the set-aside ingredients. This approach keeps some of the ingredients from sinking to the bottom of the bowl and definitely adds to the overall visual presentation. There are so many different types of brownie recipes. This one is my absolute favourite – I love the dense, fudge-like flavour. These brownies taste exceptionally good warm right from the oven, accompanied by a cup of coffee or a glass of really cold milk. Preheat oven to 350°F. Line the bottom of an 8-inch square metal baking pan with foil, leaving about a 2-inch overhang. Lightly grease bottom and sides of foil with butter. Melt sugar, butter, cocoa, oil, and salt in a medium pan over medium-low heat, stirring continuously until butter melts. Remove pan from heat and let sit for 1 minute (use your finger to check the temperature of the batter – it should be warm, not hot). Add 1 egg and whisk until blended. Whisk in vanilla and second egg until smooth and glossy. Sprinkle flour over chocolate mixture and stir with a rubber spatula until just blended. Scrape batter into prepared pan and smooth top. Bake in the centre of the oven for 25 to 30 minutes, or until a metal or wooden skewer inserted into centre comes out dry. Remove pan from oven and let cool on a wire rack. When brownies are cool, use foil to lift brownies out of pan. Cut into 12 equal squares. Add the love: Place a brownie square on 8 plates, sprinkle with icing sugar, and top with a scoop of ice cream. Drizzle ice cream with 2 tablespoons caramel sauce and place a strawberry and a mint sprig on the side. Tip: If you prefer, you can substitute whipped cream for the ice cream.